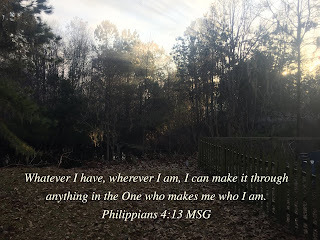 My Strength: Philippians 4:13 - "Christmas Feelings"
Philippians 4:13 - "Christmas Feelings"
There are so many going through 'junk' that I wish I could just take away for them. I pray they will draw closer to the Lord through their tough days. I pray He will become greater in their lives. I pray they will depend upon His strength throughout the days ahead. Paul tells us in Philippians 4:13 that we can do anything through His strength. I know this to be true. I have lived it out over and over again. Thank You for Your strength that empowers me to do whatever comes my way. Thank You for this knowledge that encourages me. Thank You for cleansing me today so You can fill me to overflowing with more of You. Thank You for encouraging me through tough days. May You be an encouragement to those I prayed for this morning. May You become greater in their lives. May they realize the empowerment of the Holy Spirit today in a different, new way. Thank You Jesus for being My Strength. Amen. Nehemiah 8:10b - "Where Are You Christmas?" Psalm 49 - "Joy to the World (Unspeakable Joy)"
Jeremiah 29:11-12 - "Frosty the Snowman"
Matthew 1:21 - "Happy Birthday Jesus"
Luke 1:29; 2:19 - "A Baby Changes Everything"
I Peter 5:2,3 - "Silent Night"
Matthew 1:23 - "My Grown-up Christmas List"
Romans 15:13 - "Somewhere In Your Silent Night"
Romans 15:13 - "Joy to the World"
Romans 15:13 - "There's No Place Like Home"
John 1 - "Sweet Little Jesus Boy"
Luke 1-2 - "Mary Did You Know?" Luke 2:11 - "Jesus is the Reason for the Season"
Romans 15:13 - "Make Room"
I Peter 3:13-18 - "Jesus Is The Reason"
Isaiah 9:6 - "Where You Are (Son of God)"
Psalm 24 - "King of Glory/Christmas Offering"
Philippians 2:10-11 - "Christmas Offering"
Psalm 91:1 - "Somewhere In Your Silent Night"
Philippians 4:13 - "I'll Be Home For Christmas"
Luke 1:29; Luke 2:19 - "Grown-up Christmas Wish"